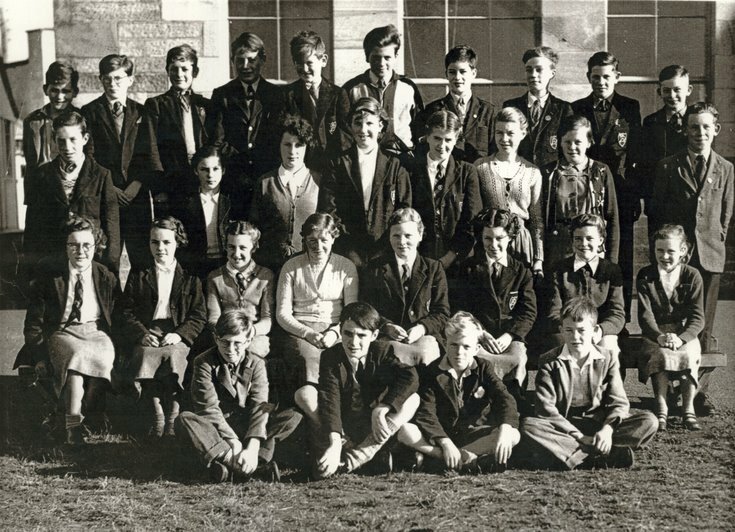 Group photograph of Dornoch Academy about 1956 with details, as far as known, of those shown. Back Row: Ian Matheson, Jocky Henderson, Don Morrison, Michael Robertson, John Calder, Donald Macdonald, Ian Balfour, Alastair Matheson , ?...... , Ronald Sim 3rd Row: Alasdair Fraser, Jean Landers? , Mary Vass, Sheena Davidson, Agnes Morrison, Mary Irvine, Mavis Paterson, Nigel Munro 2nd Row: Lilian Mackenzie Jean Macdonald, June Grant , Ann McKay Thelma Gunn, Jan Cowan, Maisie Thomson, Evelyn Roberston, Amelia Mackenzie Front Row: David Munro, Michael Sutherland, Hamish Macnab, Alasdair Campbell. Between Donald Macdonald and Ian Balfour is Danny Mackay who died recently in Tongue; between Alastair Matheson and Ronald Sim is Ian Brown, now a retired tanker skipper, living in Grantown. Thelma Gunn, not Helma.